so that I may stop while the path is clear. when the vision blurs from out of the blue. like you carried Christ in your close embrace. His feast day is July 25. The popular and best known history of Saint Christopher is the patron saint of travel and a number of other patronages. Surprisingly, we know more about what St. Christopher is today than we know about his life and death while here on earth. There is general scholarly agreement that he died in the third century. His given name was Offerus or Reprobus, no definite record. He is known to have died a martyr of the faith after converting thousands to Christianity. Here is the St. Christopher biography according to that legend. He was a Caanite that served his king, especially in matters requiring strength. The tale has it that he was huge (possibly 18 feet?) with an ugly face and an even uglier demeanor. During his service to his king, he decided he was going to serve the greatest king of all. He found that next supposed greatest of them all. During his service to his new king, he saw the king make the sign of the cross and flee the area in fear. St. Christopher found the king's fear was fear of the mention, sign or presence of the devil, so obviously this as not the greatest of all kings. St. Christopher then sought out the devil and began serving him. He did notice one day that the devil was afraid of the cross and he feared Jesus Christ. Off he went to find this next possible greatest king of them all. His search led him to a hermit, who gave him knowledge of the Christian faith. Saint Christopher asked the hermit how he could serve this greatest of all kings. There was a dangerous river nearby that people had to cross. Many died in the attempt. 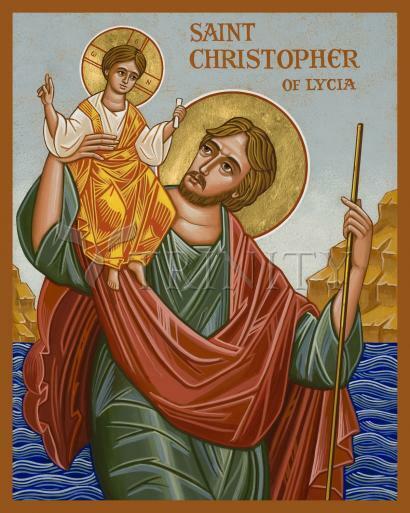 The hermit told St. Christopher that because of his great size and strength, he should assist people to cross and this would be pleasing to God, St. Christopher's newfound king. He assisted many travelers and he was happy in his service to God. One evening outside his hut a little child all alone asked if he would help in crossing. St. Christopher hoisted the child upon his shoulders and started across. The river became turbulent and the child became heavier with each step. He struggled across with great difficulty and said to the child …"I do not think the whole world could be as heavy on my shoulders as you were." The child replied you had on your shoulders not only the whole world but also him who made it. I am Christ your king. Great tale enjoyed by many through the centuries.